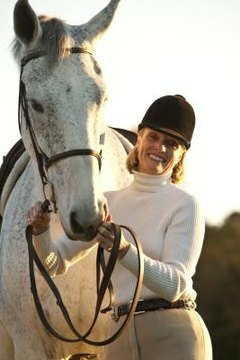 There are many acceptable ways of holding the reins on a double bridle. The double bridle includes one set of reins attached to the snaffle or bridoon bit and the other set attached to the curb bit. Most riders learn to use double reins with the simple two and two method, a traditional and basic method of holding the double reins. Juggling two sets of reins plus a riding whip or crop can seem impossible at first, but with some practice you can learn to ride effectively using one of the traditional styles of holding double reins. The crossed two and two method is probably the most common method of holding double reins. In this method, the left curb and snaffle reins are held in the left hand, and the right curb and snaffle reins in the right hand. Mount your horse and pick up the reins so that the curb rein (the bottom rein) is held between the little finger and the ring finger as you would hold a typical single rein. The snaffle rein is held on the outside of the little finger. When you pick up the snaffle rein, the curb and snaffle reins cross over, forming an X shape with the reins. Another version of the two and two method of holding double reins is to hold the reins so that they do not cross over. The snaffle rein is held between the ring finger and the middle finger, while the curb rein is held in the tradition position between the little finger and ring finger. Some riders prefer this method because they can give their horse very precise cues through the separate reins. The curb bit acts on the horse's skeleton, while the snaffle works on his muscles. A skilled rider can then use each set of reins to precisely adjust the horse's position during advanced schooling. The three and one method is perhaps the oldest method of holding double reins. The left hand holds three reins, while the right holds only one rein plus the rider's cane, whip or crop. The correct placement of reins in the left hand is to hold the left snaffle on the outside of the little finger, the left curb rein between little finger and ring finger, and the right curb rein between the ring and middle fingers. The right hand holds the right snaffle rein in the traditional position between the right little finger and ring finger. The left hand is held more to the center of the horse directly over the withers than off to the left of the withers. Like the two and two method, the fillis method calls for holding both left reins in the left hand and both right reins in the right hand. However, the reins are held between different fingers. In the fillis method, the curb rein is held between the little and ring finger. The rein then comes up through the hand and passes out and over the top of the hand. The bridoon or snaffle rein passes over the top of the hand and between the thumb and index finger. The rider has more control over the interplay between the snaffle or bridoon and the curb bit from this hand position.